Zsa Zsa Gabor is reportedly making peace with her life as the iconic actress and socialite asks for her last rites. Zsa Zsa Gabor was admitted to the Ronald Reagan UCLA Medical Center just two days after being released for undergoing hip surgery from falling out of bed. The 93-year-old actress was reportedly readmitted after she began experiencing pain and bleeding. Doctors discovered she had developed two blood clots and opted for surgery to correct the complication. Allegedly, Gabor’s grave condition compelled the actress to ask a priest for her last rites. John Blanchette reportedly told TVGuide.com he heard the news from Gabor’s husband of 24 years, Frederic von Anhalt. “It’s very sad,” her publicist said. 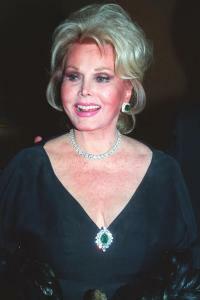 Hungarian-born Zsa Zsa Gabor, became just as famous for her nine marriages as she did for her films over the past six decades. One of her first starring roles was in the classic Moulin Rouge.